The Gap Between Indie & “Big” Podcasting – Cause for Concern? As I pulled on my blazer, I felt a deep pang of regret for leaving England without a bigger jacket. That regret was compounded further as I stepped out of the lobby of the Hotel Edison on to west 47th street and turned left into the biting cold of a bright New York morning, headed for the RAIN Podcast Business Summit that was taking place at the New World Stages venue that morning. Rebel Base Media CTO Kieran McKeefery and I had been invited to attend the event and, given we were headed to Orlando for Podfest Multimedia Expo just a few days later, found it easy to switch our flights and to book a few days of back-to-back meetings in the city with everyone from some of the large content production studios to agencies such as VaynerMedia. Following those meetings, it became clear that audio growth continues to dominate the headspace of everyone from podcast production studios to full-service agencies, with production studios looking increasingly at how they can maximise the impact of their inventory on not only their business but to the benefit of their audience, too. Brand, digital & full-service agencies, on the other hand, are facing challenges when it comes to two sides of the podcasting coin: how to sell podcasting to their clients and how to make it work well for the long-term, outside of simple positioning via branded content. The sessions & chats that Kieran and I had in the run-up to RAIN’S Podcast Business Summit, put me in an investigative mindset for the event, with one question really dominating my thought-process: “Big” podcasting is here and many indies are becoming concerned about it – is there a valid reason to be worried? In short: yes. Kind of. Since the “Spanclet” merger (Spotify, Anchor, Gimlet – anyone got something better than “Spanclet” for me? ), VCs are looking to pour even more money into the podcasting space (Evo has a super little episode of his Podcast Pontifications on this topic) and with everyone entering the space as “the Netflix of podcasting” (Oh, there’s a post coming on that, believe it…) it’s clear that indie podcast creators should be a little nervous – after all, the industry was born and bred by indie creators and the vast, vast majority of podcasts are made by indie creators at varying levels: from Steve Lazarus at Your London Legacy, to Aaron Mahnke at Lore plus, everyone in-between. The podcasting industry is seeing an influx of everything, the likes of which it’s never seen before: from VC money to content; from people to technology – there’s something new every single day. An industry, though, is what this is. 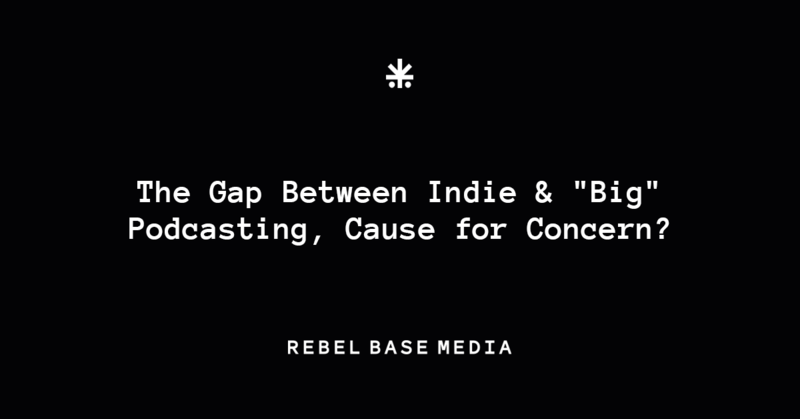 And there’s no avoiding the fact that the industry is changing; there’s a split happening between the indies and the “big” podcasters, with one of the challenges being as pure and simple as this: indie podcasting and “big” podcasting have different goals. “Big” podcasting is just that, “big”. It’s essentially focussed on high-quality production, rapid title launches and sales of inventory quickly, with the success of any given content being measured as such. In fact, it’s a little like the comics industry – build inventory, sell it, if it doesn’t perform then pull it quickly. But indies don’t strive to be “big”. Indies generally strive to serve a loyal, dedicated audience rather than to be a part of an “industry”. If you look at the Anchor/Spotify deal, in particular, you have to wonder what their plans are in this regard: most Anchor content is dead content made by indies (ok, people trying it, at least), yet Spotify’s prime audio focus so far has been highly produced content that they can market as premium-quality audio to justify the upgrade to Spotify Premium. Outside of the Anchor tech stack being attractive to them, the Anchor content is less than desirable for a premium-content company such as Spotify. I guess we’ll see how that goes. I’m fortunate enough to talk to indie podcasters every day, but also to talk regularly to the NPRs, IABs and others who operate at a level that many indies feel intimidated by and as an indie podcaster myself, I approach this worry slightly differently: “Big” podcasting isn’t here to take our space, it’s here to deliver something to the people who want their “something” in a different box, that’s all. Of course, there are the “metrics” debates, with everything from IAB certification to NPR’s RAD initiative taking up column inches week-in, week-out and although these are very important debates to have, regardless of what happens in that space, people are still at the core of the industry, especially for indie podcasters who focus on people over numbers, every single day. At the “big” podcasting level, ad buyers are ad buyers. They’re used to buying ads in the same way that they’ve always done and the bigger the brand, the more uniform they want their data insofar as standardization goes. If a full-service agency is selling ad space across multiple channels, with podcasting being one of them for example, they’re looking at the whole ad-spend within a multi-channel strategy and for now, podcasting simply gets thrown into that mix and termed using language that ad buyers are already used to hearing – it’s not the best way to appraise podcasting’s ad potential, but right now it’s worth remembering that the podcast space is still really new to brands, given that it’s only tipped into the correct audience range for those brands within the last few years. That’s where networks such as Wondery, NPR et al are playing and they’re trying to figure it out every single day. Educating any market, in this case: ad-buyers, to think differently about something that kinda-looks-like-probably-might-be-almost-radio-but-somehow-is-also-like-on-demand-tv-at-least-as-far-as-I-can-tell-as-an-ad-buyer-who-isn’t-as-passionate-about-podcasting-as-you-are is going to take time and is a slow, slow process as the technology in this space moves, shifts, falters and grows. But as an indie, you still have control over your ads and how you monetize your content. By appreciating that monetizing isn’t easy but that is is very, very doable on your own (*cough* Trivial Warfare) you can take a layer of “worry” out of your podcasting day – let the “big” podcasting guys play in their sandbox for now and you, well you just stay in lane and do what you’re superb at. Podcasting is getting a little crazy but there’s no real need to panic – nothing is changing really, not when you dig deep, and not right now. When you cut through all of the noise, podcasting remains the same for indies and the goal hasn’t changed: share your voice, share it proudly and nurture your audience as friends. P.S. This post was inspired by chats with the following people over the last few weeks: Rob Walch, James Cridland, Todd Cochrane, Mike Dell, Elsie Escobar, Stacey Goers, Joel Sucherman, Andy Bowers, Jess Kupferman, Kieran McKeefery, Evo Terra, Steve Pratt, Zack Reneau-Wedeen, Chris Krimitsos, John Rosso, Lee Cornell, Jonathan Oakes, Jared & Dan at Podcast Movement, Yu Wang, Drew Ackerman, Kathy Rainaldi Doyle, Mignon Fogarty and plenty more. Thanks, folks.